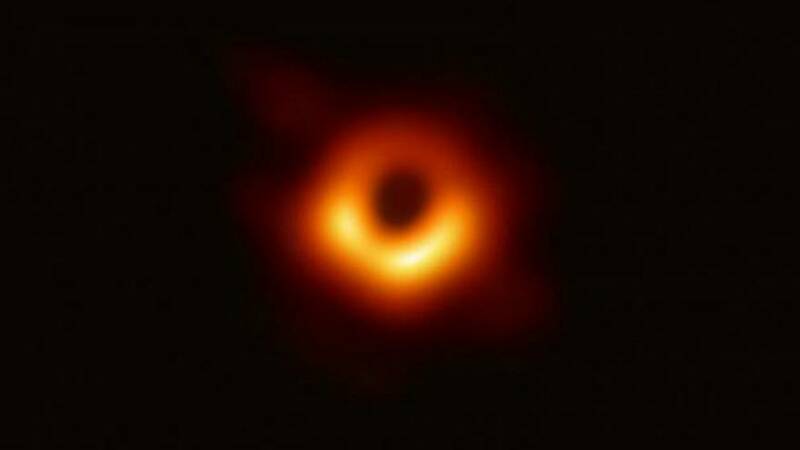 This is the first-ever image released of a black hole. The picture was unveiled at simultaneous press conferences across the world on Wednesday, including one in Europe that you can watch in the video player, below. Black holes are objects or regions of space that have collapsed in on themselves, which results in a huge amount of mass being concentrated in a very small area. Their gravity is so strong it pulls in everything around it, including light. There are two types of black holes, the garden-variety black holes, which are 20 times bigger than the sun and the supermassive black holes. which are at least a million times bigger. What black hole have scientists captured here? The image reveals the black hole at the centre of Messier 87, a massive galaxy in the constellation of Virgo. It is located 55 million light-years from Earth and has a mass 6.5-billion times larger than our solar system's sun. This major breakthrough was the result of an international scientific collaboration called the Event Horizon Telescope project. They established a network of eight telescopes across the world, which then scanned the black hole over a period of 10 days. The telescopes are located at challenging high-altitude sites, including in the Spanish Sierra Nevada, volcanoes in Hawaii and Mexico, mountains in Arizona, the Chilean Atacama Desert, and Antarctica. How is it possible to photograph a black hole? The scientists look for a ring of light — disrupted matter and radiation circling at tremendous speed at the edge of the event horizon — around a region of darkness representing the actual black hole. This is known as the black hole's shadow or silhouette. "We have achieved something presumed to be impossible just a generation ago. Breakthroughs in technology, connections between the world's best radio observatories, and innovative algorithms all came together to open an entirely new window on black holes and the event horizon." "Black holes are one of the most extreme predictions of the theory of general relativity and this is something we can now test in detail. And in the future. This is so important because the two most fundamental theories of our universe, quantum physics, which describes the small things, and relativity, which describes the big universe, don't go together at the event horizon. And something has to happen there. Whether we'll be able to see what goes wrong I don't know but maybe eventually, at some point, we'll found out how to bring these two theories together." "It really is a massive, massive moment for people in astrophysics. "In the last few days, I've been speaking to some of them and you see the emotion in their eyes. They are incredibly excited about this. It's a kind of before and after in their careers. "Just think about this: they've taken an image of the supermassive black hole in the galaxy M87, 55 million light-years from Earth. It is an object they knew was there but they were not able to see. Using this Event Horizon telescope they've managed to actually create this image. A real image of a supermassive black hole."